Mighty No. 9 studio Comcept has been acquired by Level-5 - custodians of the Professor Layton and Yo-Kai Watch franchises - to create a new company named Level-5 Comcept. This will be an entirely new studio built upon the foundations of Comcept’s existing staff, which currently consists of about 15 people. As many of you may have heard, Akihiro Hino (LEVEL-5 CEO), and Keiji Inafune (comcept CEO) will be co-founding a new company “LEVEL5 comcept”. What does this mean, you ask? 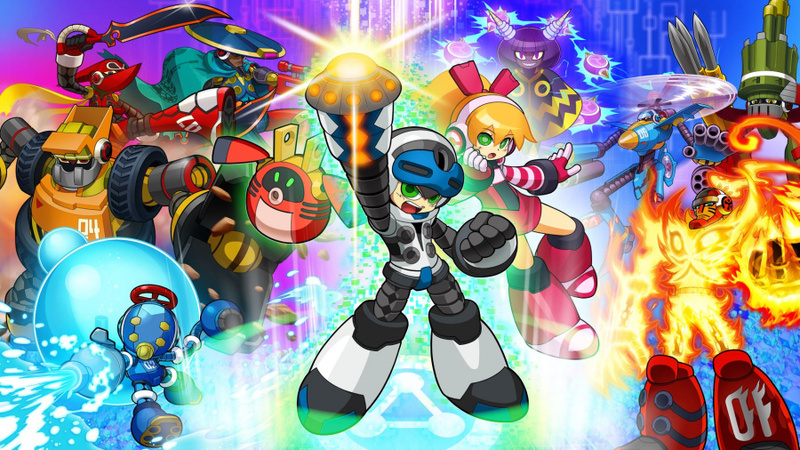 It means that Akihiro Hino, and Keiji Inafune will be teaming up to make new games!!! This does not affect Mighty No. 9 in any way, but who knows, maybe in the future Beck, and your favorite LEVEL-5 characters may be tagging along in new adventures? The possibilities are limitless here. Hand Held versions: They are not being cancelled, we are still in the process of porting. The porting had to be put on hold for a while due to the other versions being delayed and the recent adjustment we had in Comcept. However, everything is back on track now. The developer restarted the porting process in early May, and we estimate to release them within 2017 (it could be earlier, but it’s hard to estimate a more precise date at this point). We will update on this when we have more information. The question is, are you still interested in playing Mighty No. 9 on your 3DS? Well, to answer your question: Not at all interested, no. Will Level 5 teach Comcept to be a competent developer and actually deliver? "This does not affect Mighty No. 9 in any way"
From what I've heard it needs patching and improvements. Rest in peace Level 5! Why? Whyyyyy?! Also, is anyone sincerely holding his/her breath for a Mighty no 9 handheld port? Seriously, after the enormous mess-up? Might be the most bad news coming out of E3, regarding Nintendo platforms. Maybe now they can afford to finish sending out backer copies/codes of MN9 since many are still waiting on them. I will never play Mighty No. 9 again, not on 3DS or any other system. Terrible game. Moodily grabs his Professor Layton figurine and blatantly keeps it away from a Beck action figure. Watch as the 3DS version runs at 20fps on the New 2DS. I wonder if it will get delayed? Great timing as always with their updates, just started to play MN9 on PS4 cause I gave up on the 3DS version >_>; (Plus the already released versions are super cheap nowaday tbh). As long as Comcept doesn't mess things up with Level 5, I'm not bothered either way. Somewhat interested. Plenty of higher priorities, but the game looks fun and I can't stop wondering how even any amount of possible hype backlash could make it as memetically "insulting to Kickstarter backers" as fanbrained drama queens make it out to be. I can understand frustration with glitches if there are any, but being underwhelmed alone doesn't really live up to talking and acting like the developers ran away with the money. I quite enjoyed Mighty No. 9 (until I reached that impossible end of game boss). Sure it's no Megaman 2 or Megaman X but boosting through enemies was a fairly satisfying and unique gameplay mechanic that held my attention well. It's just a shame the graphics were so boring. Best of luck to them, if it happens to make the game better during the porting process, then great. I'm doubtful the core gameplay will be fixed though, there's not much you can do about that mess. Please don't ruin Level 5, Keiji. Or I will come for you. LOL at the people who are having a panic over Comcept being bought by Level 5 as if Comcept is an infection ,and not just here. Hey, with their help and past reception it's quite possible the 3DS version could actually be decent. I'm not betting on it, but the possibility is certainly a real one. @MegaVel91 nobody is really panicking, you sjw. I read somewhere yesterday that Mighty Number 9 is a mess of a game. This is good news how? I would think it's good news for Concept that Level 5 bailed them out somehow. But that's just a guess. That's awesome, now if both handhelds versions (the 3DS and PS Vita) can be as enjoyable as games like Mighty Gunvolt series then I will definitely looking forward to this. Just saying that crazy things happens when Inafune is envolved in a game production. Everybody lost interest on M9 shortly after its tumultuous release for a game that essentialy did not deliver what gamers wanted, nor what was promised by the KS campaign marketing. Then all was quiet about the 3DS port (or version) and I thouth it was silently dead and no one was crying at all, except the backers. Now Level-5 acquires Comcept and we see some news about Beck an his fellas on 3DS! Well, I hope this move is for the better. I'm optimist to see big games coming out of this new studio, would love to see L5 charm and talent on a godd, old-school platform in the future! I heard Mighty No. 9 was a critical and financial failure. Should we be excited that Jem is coming to special edition bluray too? Hopefully this is the beginning of great games and new franchises. Mighty No. 9 wasn't that bad, it just needed more polish and they went with some silly decisions like that awful voice action. @nhSnork Wii U version was sincerely unplayable for me. @G_M Do you even understand the term you're using? Cause seriously. You're using the term entirely wrong, and on top of that, it doesn't even apply to me. So nice try with the insult, but you're going to have to try a lot harder to get a rise out of me. Although I may be the only person who still legitimately wants it on the 3DS, I, for one, am pleased that the porting process seems to be taken seriously, with Level 5 around now, and I can't wait to play it, as it always seemed more like a handheld game to me, like most Mega Man titles. Isn't Comcept just an ideas house, and wasn't MN9 developed by Inti Creates? I didn't play it, but I'm quite sure that's the case. I'll pick it up if it somehow gets a boxed copy on 3DS. @MagicEmperor There are Professor Layton figures? Part of me was a bit interested for a second. Maybe a new 3DS port could feature item selection on the touchscreen, fix the sound so music can be heard over voice acting and effects, add an option for skipping cutscenes, etc. Not at all interested in MN9 for 3DS. I am cautiously optimistic about the merger though. Hopefully this means that Level-5 will be able to keep a tight ship on them. As much as Inafune hated working at Capcom, they were at least able to keep a rein on things. @MarioPhD Comcept's own in-house staff also worked on Comcept, of that I'm certain of. Inti Create's involvement was more of a collaborative effort. Meh, its all about Inti Creates' Mighty Gunvolt Burst now. Well, Comcept needed a leash. Level-5 might be a godsend for those guys. I don't know how much of a godsend can Comcept be for Level-5, however. @OrigamiSquirtle Well, I have a Revoltech. Perhaps not officially a "figurine", but hey! Mighty No. 9 was far from a good showing of Comcept's skill as developers, why would you want to purchase them? Just let Inti-Creates keep working "alone" on the Mighty No. 9 series. I think they're on the right track with Mighty Gunvolt Burst.